Give them Halloween thrills and chills with Creepy Crawly Marshmallow Spiders! Mini marshmallows coated with melted chocolate form the bodies of these scary Halloween treats. Kids love to add legs and eyes to Creepy Crawly Marshmallow Spiders with assorted candies. Mix marshmallows and melted chocolate until marshmallows are completely coated. Drop by spoonfuls onto sheets of wax paper to make 24 clusters for the "bodies" of the "spiders." Cut each 12-inch piece licorice into 8 pieces. 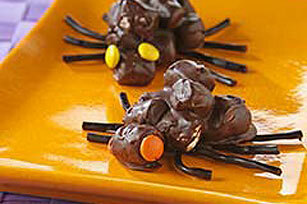 Decorate each spider with 8 pieces of licorice for the "legs" and 2 candies for the "eyes." Let stand at room temperature or refrigerate until firm. Kids will enjoy making and decorating these spooky treats. They'll also enjoy eating them, but keep tabs on portions. Stir in 1/4 cup coarsely chopped PLANTERS Walnuts or Dry Roasted Peanuts along with the marshmallows. Makes 12 servings, 2 spiders each.